More nail art for short nails! Or long nails, or somewhere in between. I broke two of my nails the other day by pulling at my nail polish drawer a little to vigorously, but I like this length better to be honest. 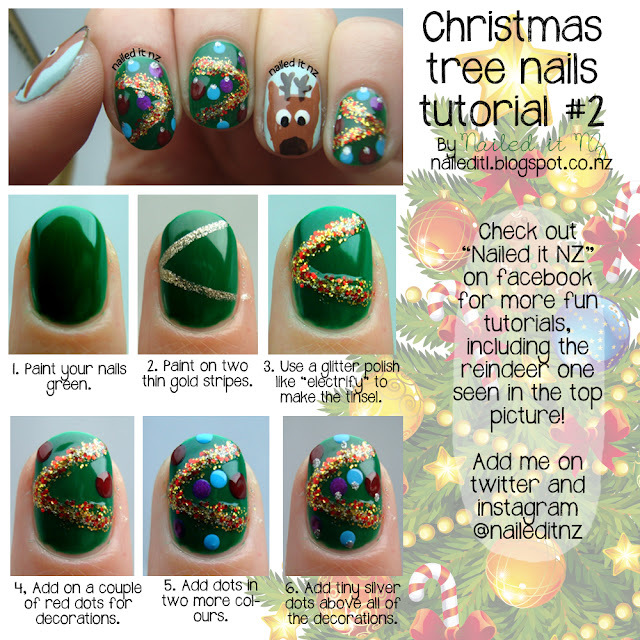 So, Christmas tree nail art! I like this better than my last Christmas tree nail tutorial, although jeez those ones are popular! It's awesome! As you can obviously see, there's a little reindeer on the thumb and ring finger - I've done a tutorial for that too! It's going to be published as a guest post on The Manicure Hut soon, and I'll make a post that'll link to it asap. These two will probably be the last of my Christmas manicures this year, but I think I'll focus on New Years tutorials next! China Glaze: Electrify, Red Satin. LA Colors: Art Deco Red. Oh yeah, for those in the Northern Hemisphere, don't worry. It's 2pm on the 22nd here and we're totally still alive. Thought I'd give you a heads up haha. What are your plans for Christmas? I'll splitting it between my family and my husband's family. Thankfully they're all in the same town so no travelling! I hate holiday traffic!